As the weather continues to get colder at night, rodents seek refuge in your homes. If you haven't taken notice already, you may start to see an increase in spider activity in the next couple of weeks as the temperatures begin to cool off making way for Fall. While it is not widely known, male spiders typically seek a mate around late Summer early Fall. This includes tarantula spiders, which according to Mount Diablo State Park rangers, they have already begun seeing tarantulas popping up early due to the cooler temperatures. Be advised that mating season usually lasts through the end of October. It's good to keep in mind that while tarantulas are intimidating to look at (for all you arachnophobes!) they are quite docile and non-aggressive unless provoked (which we DO NOT recommend!) Most female tarantulas remain in their burrow, so if you run into a tarantula while out hiking or if you live on acreage, chances are it's a male. Fun fact: Male tarantulas have been known to search for up to four miles to find a mate! Kind of romantic! We hope this helps answer some of your questions about the increase in spider activity as of lately. If ever you have a concern or need your pest control technician to come back out to do a respray for you, don't hesitate to give us a call! Flying ants are often confused for flying termites. It's an easy mistake to make if you are unsure of what to look for. It can also be helpful in knowing how to treat the problem since nobody wants flying, breeding bugs around the house! Both bug species grow wings in order to breed and are referred to as a "swarmer" but thankfully their anatomy differs quite a bit from each other allowing the distinction easier to identify. For starters, ant antennae are bent as opposed to termite antennae, which is straight. An ant swarmer's body has a pinched, defined waist as opposed to the thick, straight waist of a termite swarmer. The wings of the ant are often uneven in length, white in color and stacked when spread open. A termite's wings, however, are typically even in length, yellowish in color and separated when spread open. If ever you find yourself in a situation where you are unsure of your type of swarmer, give us a call and we will do a complimentary evaluation for you. Make sure to keep a few swarmers or fallen wings in a small, lunch baggy so the inspector can see what your seeing to allow him to make further recommendations. 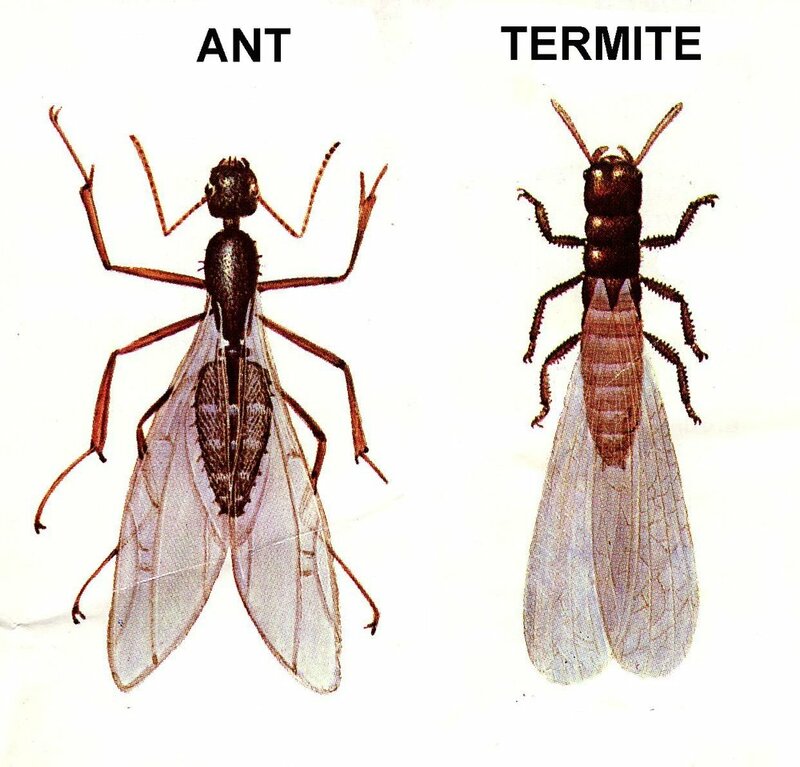 For additional questions about knowing the difference between flying ants and flying termites, feel free to give us a call at (951) 694-8100. We can all agree that ants are a real nuisance this time of year as the temperatures heat up and colonies underground start feelin' the burn. Many ants will turn to the comfort of your own home to seek out food and moisture. Aside from keeping your trusty pest control company on speed dial during these summer months, here are some big helpful tips to keep the those little pests away! 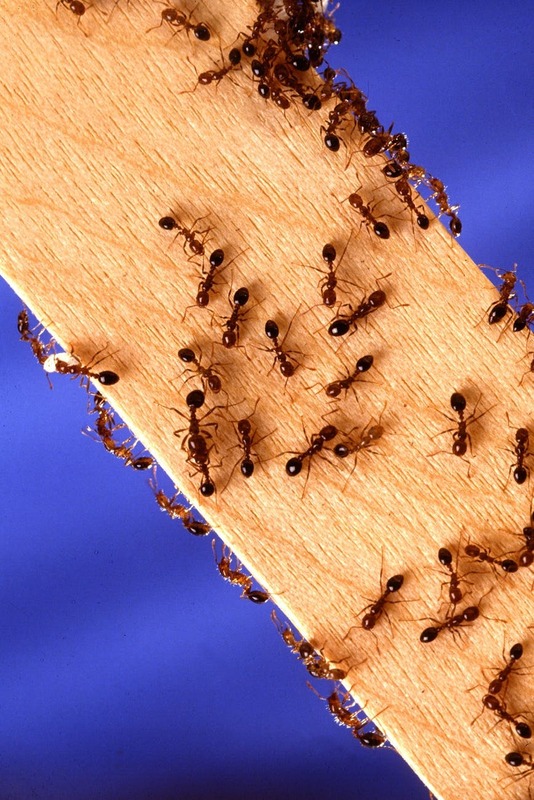 First and foremost, after a pest control visit, ant activity may seem to get worse before it gets better. This is because if bait was used, the ants need time to carry the 'food' back to their colony in order to share, and this will be much more effective when wiping out the entire colony preventing future visitors of this particular colony. While it may be *extremely* difficult to avoid intervening with the invasion during this time, (DO NOT use your own Raid or pesticide to wipe them up right away) you need to let the bait work it's magic. After allowing the bait to be carried back by the ants over-night, carefully wipe down the counter with Windex the next day, which will remove any and all pheromones that the ants left behind so they won't be able to return. By this point, the colony should be wiped out and you can give yourself a congratulatory pat on the back! As you already know, ants are serious scavengers. It always helps stay ahead of an ant invasion by keeping crumbs swept up and pet kibble stored securely. We always advise buying plastic containers to store pet kibble so ants aren't attracted to the dry food. (Fun Fact: This will also double in preventing a rodent problem as well!) If you feed your pets outdoors and leave a bowl of kibble for them to graze on through out the day, we advise placing the food dish within a shallow bowl of water. This creates a moat around the food dish, making it impossible for ants to access the dry food within. We suspect that your pet will encounter less unwelcome guests to his or her dining experience when this method is used. In closing, if you have regular pest control service, just know that you have unlimited call backs in between services for reasons like ant invasions. We understand that regardless of taking ALL the preventative measures out there to avoid unwelcome pests, they can and will pop up every now and again. Please know that you are NEVER bothering us by requesting a callback visit, because will do whatever it takes to make sure you are living in a comfortable, pest-controlled environment. So, you have a gopher problem. The most common gophers we have in California are the pocket gophers. They typically spend a majority of their lifetime underground, so spotting one above ground is a rarity. Aside from the obvious reasons for controlling a gopher problem, such as curb appeal and overall aesthetic, you shouldn't overlook a gopher problem. If left to their own devices, gophers will destroy expensive landscaping and threaten homeowner safety by potentially burrowing under the foundation, and in some cases, cause the home to collapse. To prevent this from happening, there are several methods used to treat a gopher problem. Some of these methods are bating, trapping, using a Gopher X machine or fumitoxin, which is a inorganic chemical compound. Gophers are very territorial in nature, so naturally this makes them very stubborn to get rid of! Treating gophers is easy if you have a gopher specialist who is there to help. Often times, DIY gopher control is costly, frustrating and ineffective. Needless to say, we definitely do not recommend taking on your gopher problem on your own. Unfortunately, if you've had a gopher problem in the past or have neighbors that are currently experiencing a gopher problem, the likelihood of having an ongoing gopher problem, yourself, is very great. In light of this, we recommend getting on a gopher control service. Give Black Knight a call (951-694-8100) to get in touch with our gopher specialist who can recommend the best method to control your unique gopher problem! We promise you won't be disappointed!